Santa Margarita, Redondo Union and Temecula Valley won division championships at the 5th annual Sticks & Stones Invitational on March 23-24, 2012 at Trabuco Hills High School. Blue Division: Santa Margarita was the champion, beating Los Alamitos and host Trabuco Hills to reach the finals. There, they beat Foothill — which had beaten El Toro and Corona del Mar — by 6-2. Foothill won the Sticks & Stones title last year. Trabuco Hills took third, beating Corona del Mar, 10-7. Gray Division: Redondo Union won the title, beating Esperanza and Aliso Niguel to reach the finals. There, they beat Carlsbad — which had beaten Newport Harbor and Laguna Hills — on a last-minute goal, 6-5. Aliso Niguel took took third, beating Laguna Hills, 7-5. Orange Division: Temecula Valley emerged as champion, beating La Canada, 8-6, in the finals. Rosary took third, beating Mission Viejo, 9-6. COACH/FANS/ UMPS: TOURNAMENT GUIDE IS HERE! CLICK ON BRACKETS BELOW FOR FULL RESULTS! … and across the Southland! 2011 S&S Finalists: Trabuco and champ Foothill! Who? 21 Girls’ Lacrosse Junior Varsity teams. When? Friday, March 23, after 5 p.m. for as many as four 1st round matches. Saturday, March 24, 2012. Games may start as early as 8 am! SOLD OUT! Cost? $350 per team. ($325 if received by Oct. 1, 2011) Checks payable to “Trabuco Hills Girls’ Lacrosse.” Priority given to those programs that register and pay first. Rain? If heavy rain occurs and closes our grass field, two games per school will be scheduled on the turf field only. No additional refunds will be given. Register? 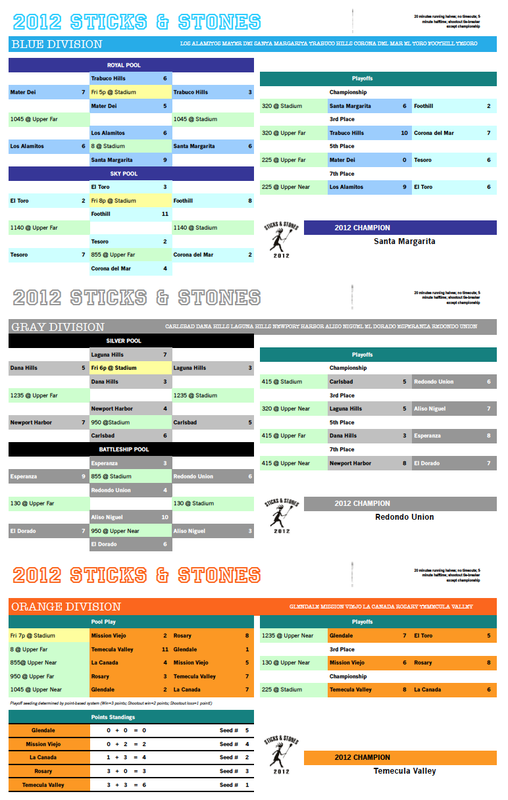 Download 5th Annual Sticks REGISTRATION FORM! A record field of 14 teams competed at Trabuco Hills High School’s 4th annual Stick & Stones Invitational JV girls lacrosse tournament held on March 26 at Trabuco Hills’ stadium and upper fields. 2009: Los Alamitos avenged loss in 2008 S&S title game with thrilling 8-7 win over Foothill!